If you have forgotten the password for your global account you can retrieve it here by entering the email account you used to sign up for your account with. If you can not remember the email address you used to sign up with please contact the Clanwars.cc Director of Operation his contact information is located on the right side of this page. Clanwars.cc is a competitive online clan-based league site for various online games. Every league (sponsored by Clanwars or run separately by other sponsors) runs in calendar month cycles. During the monthly competition matches are played in clan vs clan format and the winner of each match and the individually participants receive points for every win. In some cases the losing clan and the losing participants lose points for each loss. Whichever clan accrues the highest point total at the end of each month is crowned the winner as well as the individual "warrior" with the highest point total. Once joined you can then form a clan or join an existing clan via an invite issued to you through a private message and begin to participate in the league. Once you have created a clan you will see new clan options appear on your league menu bar (see image below) you can then invite existing members to join your ranks and participate in the league for your clans cause. You can also manage your roster by removing members or re-assigning status. The creator of the clan by default is the clan boss and is the only person who can manage the roster. A gold star typically denotes boss status. The boss can give "captain" status to other members, captain status is denoted by a silver star . Captains can do such things as issue invites to other league members and issue match challenges from the League Bulletin board and can also accept or decline incoming challenges. Just remember once you relinquish your boss status you can not get it back unless the member you gave it to relinquishes it back to you. 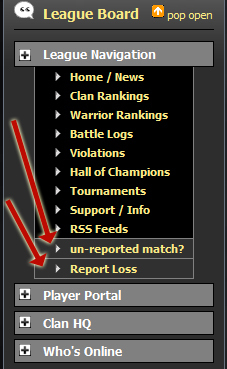 Most of the leagues are manual report based, meaning once a "clanwars" match is played between two clans the losing clan must go to the report page (see image below) and report the loss. If the losing clan does not report the match within the alloted time frame (whish should be set for each league in each leagues support page) then a member of the winning clan can file for an "Auto Report" (see image below). During the submission of an auto report it may be mandatory to attach a replay or some other proof of the match. A league admin will evaluate the request and process the request if deemed valid and apply a penalty to the the clan who did not report. 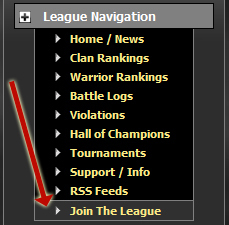 The team at Clanwars is always looking to start new leagues and reach a wider audience. If you have an idea for a league or want to lease a league and run it yourself please click on the "Create league" link at the top of each page or here Create a League. The page contains information on how to get in touch with one of our professional staff about an idea or lease option for a new league. If you played a match you've waited for the results to be posted and you are confident they were not posted you need to file for an "Auto Report"
Follow the link above from your league menu bar and fill out the form including any replays or other visual proof you have of the match. A league admin will address the filing (and you can follow his or her decision in that forum) and either grant the match and penalize the clan who failed to report (if a manual report league) or deny the request and post why. You will typically have the ability to reply to the decision and argue your case should the ruling be against you. Patrick is a graduate of Allegheny College of Meadville, Pennsylvania USA (BS Mathematics 1993), St. Vincent College Latrobe, Pennsylvania USA (State Teaching Certificate 1995), and the University of Pittsburgh Pittsburgh, PA USA (MST Telecommunications 2001). Pat's work experience includes Systems Analayst for the University of Pittsburgh, Director of Telecommunications Westmoreland County Community College and most recently President and Owner of McKula Inc. a web application development company. Patrick created the clanwars.cc gaming site and programmed the site using Microsoft asp.net 2.0 with Ajax support. Pat is married with one child. Will is located in Nottingham, UK. Will makes all the important decisions about the way Clanwars.cc is run. He became the Director of Operations in 2007. Kevin is a graduate of the University of Pittsburgh, Pennsylvania. Kevin provides touch ups and layout guidence to the clanwars.cc gaming site. He also is known as quite possibly the greatest single RTS player on the planet. Mike is located in Seattle Washington, USA and is married with three kids. Mike is a Construction Project manager, in this position he manages dispute resolution for 150 firms and over 5,000 home-owners. Mike proudly served in the US Army Light infantry for 8 years both home and abroad. Mike has earned an Associates Degree in Technology from Central Texas College. Mike has been a Clanwars.cc admin for over 4 years. James resides in Santa Rosa California USA is married and currently working towards a Computer Science degree. James is responsible for Community Management and Relations at S2 Games. James is also a Game Designer and Product Manager for the title Savage 2 at S2 Games. James regularly is invited to Electronic Arts LA office balance testing and general game consultation for a number of recently released RTS titles. James has been a Clanwars.cc admin for 7 years. Mike resides in East Bay Area, California USA. Mike is co-owner of a Wholesale Nursery and has an associates degree in Computer Science. Mike is a long Clanwars.cc member and admin - he began working with the team in 2003. Thomas is located in Grimstad Norway and is a student at Agder University studying engineering within energy and electrical power. Thomas is well respected among the online gaming community and has been part of the Clanwars.cc gaming scene for three years. In addition, he has been a head admin for BFME2, RotWK and CnC 3 for two years until he became a site administrator. Thomas is fluent in Norwegian, English and German.